The Intel Core i7-7700HQ is one of the fastest laptop processors (CPUs). It belongs to the 7th Generation Intel Core CPU family and can be found in many gaming and high-performance notebooks from 2017. A typical i7-7700HQ-equipped laptop has a 15.6″ or larger display, a dedicated high-performance video card for gaming and and other graphics rendering purposes, and a robust cooling system for handling heat of the powerful and generally hot-running components. 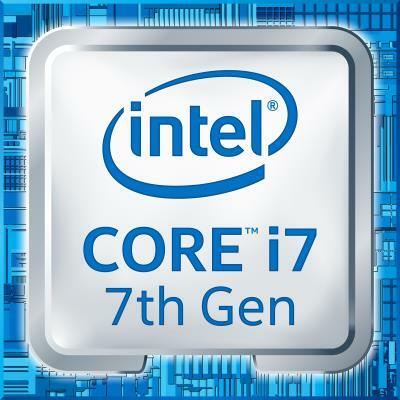 In comparison to the previous-generation Core i7-6700HQ, the i7-7700HQ provides higher operational speeds of 2.8 to 3.8 GHz, depending on usage, as opposed to 2.6-to-3.5 GHz. They both feature four computing cores, whereas the more common mainstream laptop chips feature two. That’s the main reason why the i7-7700HQ and other quad-core i7s can achieve far better benchmark results than the more widely used dual-core i7 and other mainstream CPUs. However, in many ordinary computing scenarios which don’t require a powerful processor, the difference between dual and quad core parts isn’t significant performance-wise. It’s more noticeable in highly-demanding tasks like media production and hard-core gaming. On the negative side, the i7-7700HQ and similar CPUs have power consumption rated at 45 Watts, while the corresponding dual-core i7-7500U and similar consume only 15 W, generate significantly less heat, and are therefore suitable for thinner notebooks with longer battery lives. 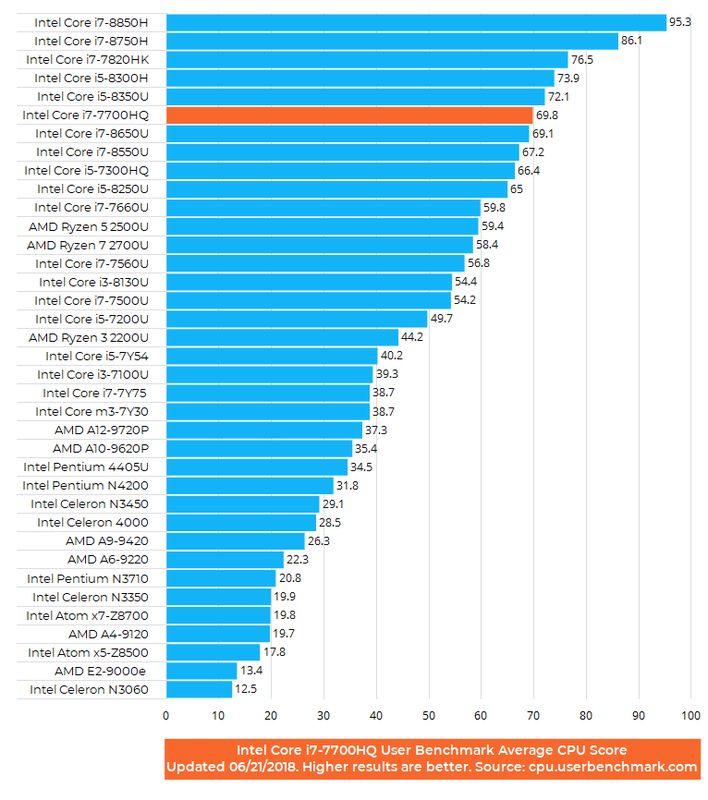 As you can see, the i7-7700HQ is near the top on the laptop CPU benchmark list. It’s very close to the enthusiast-oriented and overclockable, but rarely used, i7 HK series. 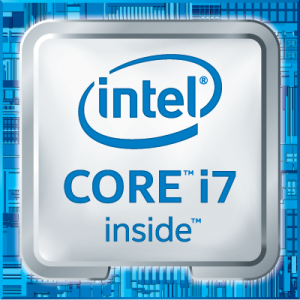 7th Generation Intel Core "Kaby Lake"
Below you can read and submit user reviews, comments, questions, and answers regarding the processor. Thank you for your contribution. I have a question or two regarding this processor. I am a film enthusiast, not too much of a gamer, although I do play games from time to time with my son, however my main job is movie/film production. My question is: How suitable is a laptop with this processor for the mentioned task? Would you recommend this type of hardware for a movie production unit. I do not produce professional films (yet), but I work a lot with this type of projects. I think i7-7700HQ is the best laptop processor for video editing at the time of this writing. Except a few even better i7 models like the 7820HK, which can be found in a few very expensive gaming laptops. Also, the i7-6700HQ is a previous-generation model, but with similar performance to the 7700HQ. However, Intel is expected to release soon the i7-8700HQ CPUs, which are expected to deliver a noticeable improvement over the 7700HQ, thanks to 6 CPU cores instead of 4 and other novelties. But on the other hand, it’s questionable whether the 8700HQ will have a great advantage over the 7700HQ during editing of your video files in your video editing program. I am in film school and have been using multiple programs for editing and creation with Adobe. Everything has been smooth sailing.